Happy Chinese Lunar New Year! The New Year officially begins January 28, 2017. This is the year of the rooster. In Chinese astrology, the rooster is considered honest, bright, communicative, ambitious, capable and warm-hearted. I made a card to celebrate the occasion using Mama Elephant’s Lunar Animals stamp set. This set contains cute critters that represent the 12 animals in the Chinese Zodiac. The cute little rooster is part of the set. 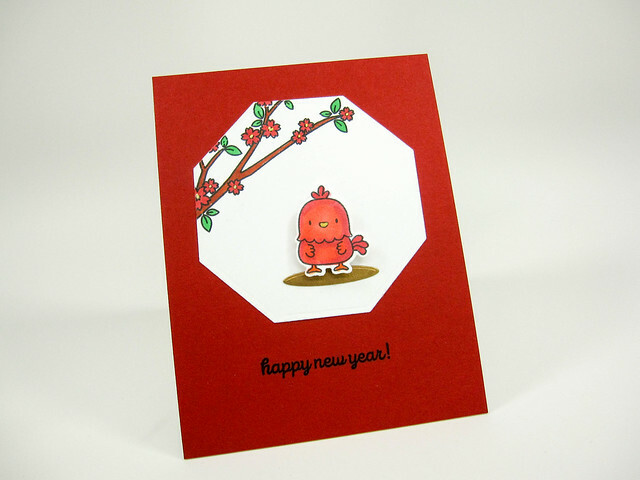 I also used the complimentary set, Lunar Extras to add a cherry blossom branch to the card and the New Year sentiment. There are several symbolic elements that I used in creating this card. The number eight is considered lucky to the Chinese, so I die-cut an octagon from white cardstock as the background for the images. Red, green and gold are considered lucky colors to the Chinese and I used these colors to color my images. The blossoms on the branch are colored in a shade of red and I add tiny gold dots to the centers of these blossoms with a gold gel pen. The green leaves on the branch stand for themselves. The rooster of course is colored in different shades of red and he has a gold beak and is standing on a gold die-cut oval so he doesn’t look like he is floating in mid-air. The branch was stamped directly onto the octagon and colored, while the rooster was stamped on white cardstock, colored and then die-cut using the Lunar Animals coordinating die set and adhered with foam dots to raise the image. The gold oval he is standing on was cut from gold cardstock. All images were colored using Copic markers. The octagon was matted on an A2-sized piece of red cardstock to add to the red them. This was in turn adhered to a top-folding A2 card base. Have a healthy, happy and prosperous New Year everyone! Stamps: Mama Elephant: Lunar Animals stamp set and Lunar Extras stamp set. Dies: Spellbinders Nestabilities: Octagon die set (large set); Mama Elephant: Lunar Animals die set; My Favorite Things Die-namics: Oval Shadows die set. Inks: Memento: Tuxedo Black ink (for images-Copic friendly); Versafine Onyx Black ink (sentiment). Cardstock: Neenah Solar White 80# (die-cut octagon); Neenah Solar White 110# (card base); Simon Says Stamp cardstock in Schoolhouse Red (used as the mat for the card front); gold cardstock from my stash (oval shadow rooster is standing on). Other: Uni-Ball Signo pen in gold, Copic markers.